An event your family will remember for years to come! Come join us for morning cruisin'! start your day off watching dolphin at play! The best way to watch the sunset, on the water! Escape to a shelling paradise! Good ol’ classic dolphins in paradise. Discover all sorts of fascinating sea life. Join us for fine angling throughout the year. Your Sanibel T-Shirts Hats Gifts and More! Looking for everything rolled into one fun filled day? Our guests call this a mini-vacation within their vacation! Get an up-close experience with Sea Horses, Puffer Fish, Starfish and so much more! is a fan-favorite year after year. we cruise through the healthy estuaries watching for dolphins and other wildlife. in their natural habitat! Join us on this smooth and fun boat tour of the Sanibel waters. of wading birds roosting above the tranquil sea. Backwater Fishing Cruise aboard "Miss Paradise"! Celebrating 32 years of the best fun filled adventures! Owned & operated by the Stewart family on Sanibel & Captiva Island since 1986. Adventures in Paradise Cruises & Tours hopes to show you just how amazing the islands of Sanibel and Captiva are and why we fell in love with the sea. Explore and take a journey with us to discover dolphins, manatee, sea horses, osprey, and pristine beaches brimming with shells, shells, and more seashells! The waters of Sanibel and Captiva provide for some of the worlds best boat cruises, and our family would like to guide you to the best fun-filled adventures. We are sure that we can tailor fun activities that will meet your needs. Serving all of Southwest Florida: Sanibel Island, Captiva Island, Fort Myers, Cape Coral, Bonita Springs, and Naples. We look forward to seeing you here in paradise! Contact us directly by calling +1.239.472.8443 every day between 8am and 5pm. 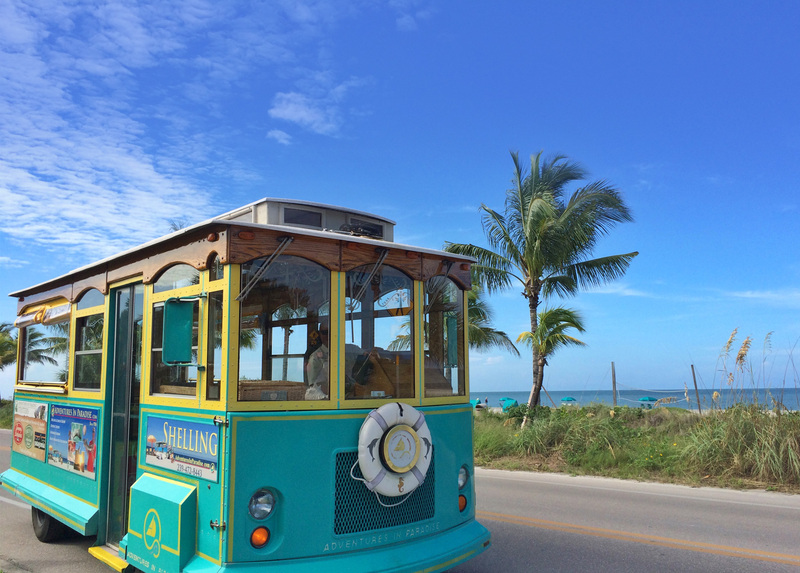 Hop aboard the island trolley for a tour of Sanibel Island! Learn all about Sanibel Island and its fascinating history! The Historical Trolley Tour is your insight into all the history, sights and nature of Sanibel Island. Enjoy the fun, from Point Ybel’s 1885 Lighthouse to Sanibel’s Historical Village & Museum. You will enjoy learning history, lore, legend, & nature throughout the island. Bringing you our love of the sea! Cruise with us for Fishing, Shelling & Lunch Excursions, Sea Life Encounters, Dolphin Watches, and Sunset Dolphin Cruises. Hop on the Adventures In Paradise trolley for the Historical Trolley Tour of Sanibel Island! Visit our "Outfitters to the Outsiders" Store located in the Tahitian Gardens Shopping Center on Sanibel. Check out our photo gallery or learn more about us. 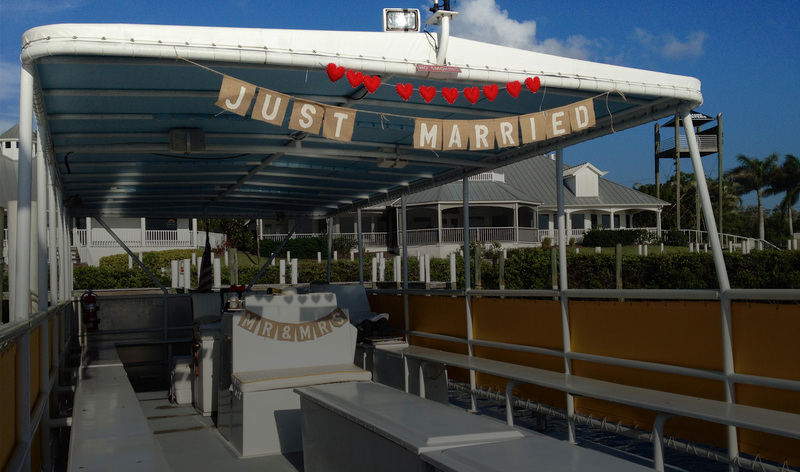 We also offer private charters and activities whether your group is large or small; Island Trolley Tours, Wedding Cruises, and more! Your wedding day is one of the most important moments in your life, and we understand that. You are cordially invited to an Adventure in Paradise where our staff will treat you, your family, and your guests like royalty. So, whether you are looking for wedding options such as Beach Weddings, Water Weddings, or want to schedule a Private Charter for that special event let our team help you to make your day special. New island eatery, a must try! Food. One of the simplest words known to man, but probably one of the most important and universally agreed upon. Good food can solve just about anything – especially from becoming hangry. We ..
We would like to congratulate Evelyn Stewart, co-founder and owner of Adventures in Paradise, on her induction to the Sanibel Captiva Chamber of Commerce Board of Directors. “We are delighted..
Sanibel sunset photo featured on NBC with Jack Black! How cool right?! Last night a sunset photo taken on the Sanibel Causeway was featured behind actor and musician Jack Black for the Red Nose Special that aired on NBC. We aren't sure how they found or ..
For a chance to be entered into our monthly photo contest! You might just win a free cruise for your family or Adventures in Paradise apparel! Details coming soon, please check back! It’s not every day you make it to the beach. You have jobs, parties, long commutes, and busy nights. Some of you reading this probably live in the Great White North where going to the beach or se..
We are so excited to introduce our new weekly blog! It will be our place to share Fort Myers & Sanibel Island information, tips, ideas, local lore, and favorite spots!